Working at TVB for 30 years in which he has a reputation for his martial arts skills, Derek Kok (郭政鴻) decided to leave the company in 2015 for more flexible work hours. As a father to two daughters, Kaley (倩欣) and Ashley (詠之), he believes that family time is the most important. Choosing his own jobs, he hopes to spend more time with his two daughters. 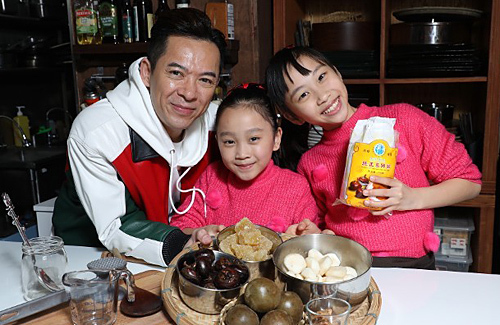 With the New Year approaching, Derek and his daughters are hard at work preparing their specialty, monk fruit water chestnut cake. Great actor. I wish him well. Think his reputation went downhill after news broke on his dating relationship with Joyce Tang and his estranged girlfriend/wife was pregnant with his child at the same time. Regardless, if he is a changed man now, wish his luck. @bearbear Article made him sound like a great family man. Sure he may have changed now but that’s taking away from all the other real nice man out there than never cheated on their partner and have always been responsible to their family.